Classic Army is a leading manufacturer of Airsoft products, setting standards for the entire industry. This model of the Classic Army Black Scarab ABR will ship directly from the manufacturing center. Additionally, the Scarab ABR is priced lower since the product is coming from Hong Kong! This is literally one of the best deals on Earth considering the package can ship to any country where its legal. It's time to get your hands on this affordable deal coming straight out of the factory! The Classic Army Black Scarab ABR Carbine AEG Airsoft Gun from Airsoft GI continues Classic Army's history as a leading manufacturer of airsoft products and a company known for its innovation and setting standards for the industry. This gun fully lives up to this Hong Kong company's dedication to total performance. 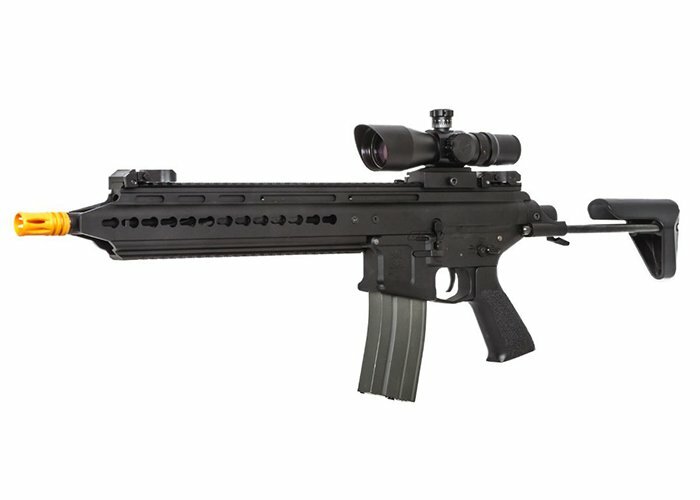 The Classic Army Scarab is a full-metal airsoft gun with an impressive number of features. Its monolithic rail system has top and bottom Weaver/Picatinny rails and side KeyMod sections. The rail system's monolithic profile gives you plenty of rail room to add optics, lights, lasers, forward grips and more, upping your game and increasing the gun's effectiveness. Set the adjustable stock into three positions or remove it from the gun's body for better portability and lighter weight. The ambidextrous charging handle, fire selector and magazine release are great for versatility. The gun also comes with flip-up front and rear sights and an ergonomic grip that help you zero in on targets while letting you shoot all day and night if you want. Internally, the scarab has an electronic trigger unit, 6.03mm tightbore barrel, silver low resistance trigger wiring, and a quick change spring system. The quick change spring system allows for fast and easy spring changes without having to go into the gearbox. The design of the Classic Army Scarab provides a very crisp trigger pull bringing users satisfaction with every shot. The Scarab ABR makes an amazing DMR platform, due to its longer barrel you can get those further and more accurate shots consistently every single time. The design of the Classic Army Scarab provides a very crisp trigger pull, bringing users responsiveness and satisfaction with every shot. The Scarab ABR makes an amazing DMR platform. Thanks to its longer barrel, you can get those longer and more accurate shots every single time. If you are looking for an airsoft gun that is as accurate as it is reliable, look no further than the Scarab ABR Carbine. Its durability and versatility make it a smart choice.